Since 1960s biomaterials have rapidly developed, and today they found use in numerous medical applications. One of the most important aspects that must be taken under consideration during their designing is their interaction with the living tissue, as it can cause a foreign body reaction and ultimately rejection of the implant. A key role in this process is being played by proteins, since they can adsorb on the biomaterial surface and act as anchors for subsequent cell binding. Two main factors that determine protein adsorption, and thus cell binding, are the chemistry and the topography of the biomaterial’s surface. 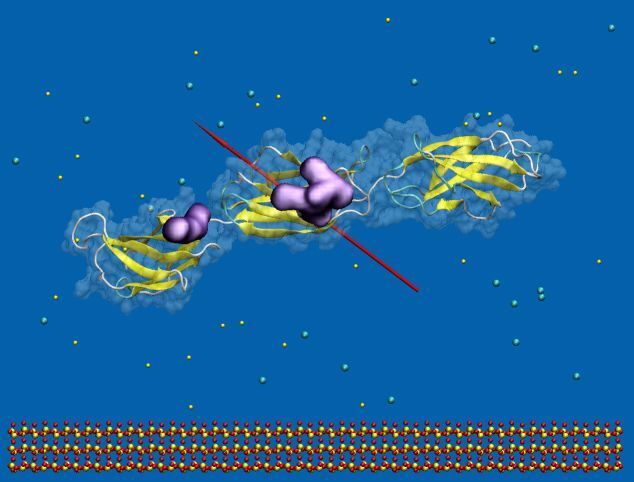 In this project we use a fibronectin fragment, which contains the cell binding region, to investigate its adsorption on a variety of surfaces (hydrophobic, negatively and positively charged). 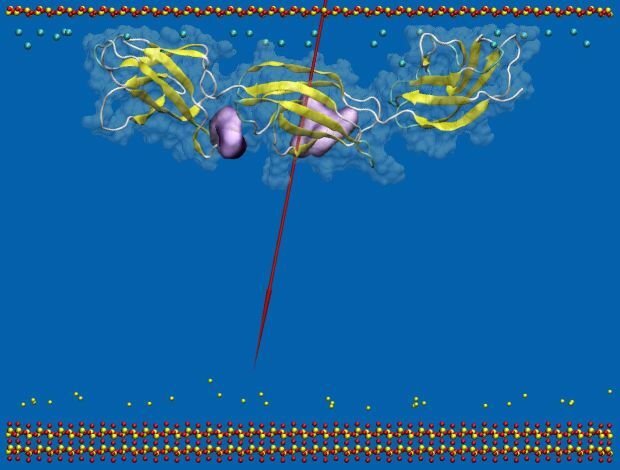 Utilizing the high processing power of the Archie-west supercomputer that is based at our campus, molecular simulations using implicit solvent model will allow a realistic investigation into the forces that are involved in the adsorption, and the actual conformation of the protein on the surface. Experimental techniques, including single molecule force spectroscopy and quartz crystal microbalance, will be used to measure the adsorption forces that are developed between the fibronectin fragment and the surface, and to identify the amount of protein that has been adsorbed. Snapshots of 100ns fibronectin fragment MD adsorption simulation at the SiO2 surface model. 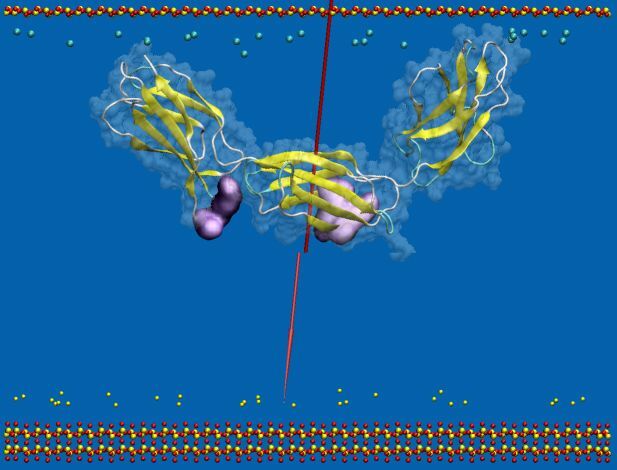 This novel approach that incorporates both molecular simulation and experimental techniques will allow us to advance the current understanding of protein adsorption. The next stage of the project is to investigate the effect of surface topography on protein adsorption. Using the results that reveal how surface chemistry and topography affect protein adsorption, the final goal will be the development of a vasculature network on the surface of a biomaterial. For more information about the project contact Evangelos Liamas (evangelos.liamas [at] strath [dot] ac [dot] uk),PhD student at the Department of Chemical and Process Enginieering or Dr Paul Mulheran (paul.mulheran [at] strath [dot] ac [dot] uk), Senior Lecturer at the Department of Chemical and Process Engineering, Dr Richard Black (richard.black [at] strath [dot] ac [dot] uk), Senior Lecturer at the Department of Biomedical Engineering and Dr Zhenyu Zhang (zhenyu.zhang [at] strath [dot] ac [dot] uk), Lecturer at theDepartment of Chemical and Process Engineering at the University of Strathclyde.